We are Perth’s most experienced and versatile event organizers, offering unbeatable value for money. Rosie O Entertainment, a family owned, family run business, has been making people laugh since 1996. Kids Parties in Perth are not the only thing that Rosie O provides. 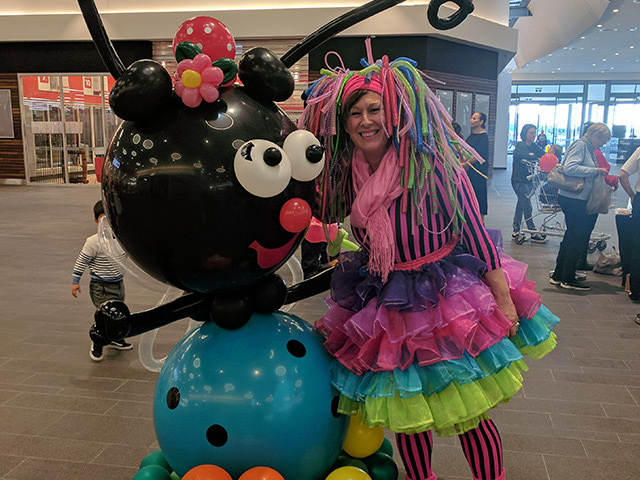 Shopping Centre Entertainment and Promotions, Bring your kids to work entertainment … Whatever your function, Rosie O Face Painters and Entertainers can help make it the event to remember. 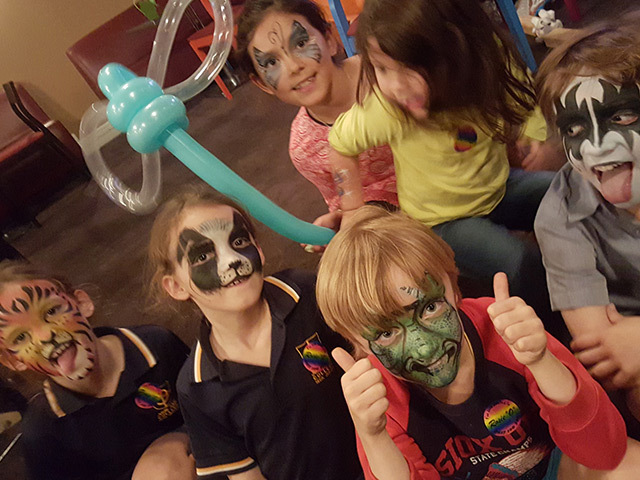 If you are looking for the most amazing kids birthday party in Perth you have come the right place. Rosie O can supply all your party needs, from the face painter to the balloon decor. Everything from one phone call. 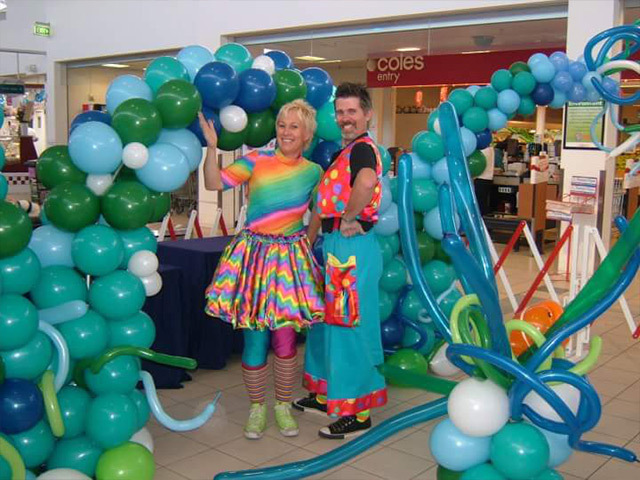 Face Painters, clowns, balloon twisters, stilt walkers, birthday party hosts, you name it , we can supply it. Rosie O truly is the One Stop shop in Perth. 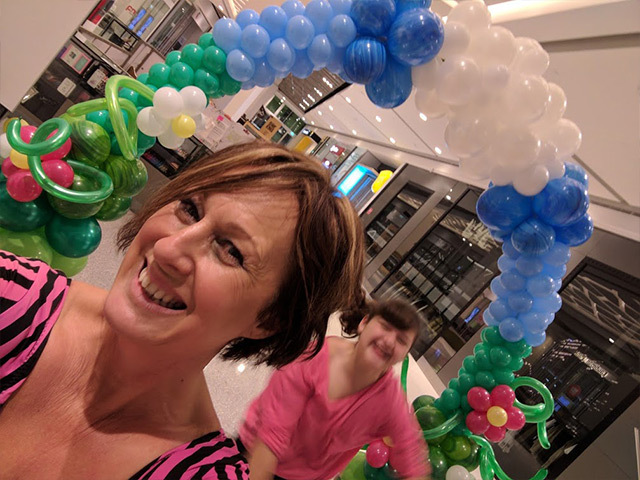 Rosie’s team of certified loonies are dedicated to creating mayhem and madness at your next event, making your guests green with envy. They’ll never forget the Rosie O experience, you’ll be addicted for life. Click here for a sample of feedback from some of our clients. One fabulous face painter or a whole team. Rosie O Entertainment supplies everything that you could possibly imagine. Bubble magic with the tunnel of bubbles, Amazing face painting, Balloon twisting that will blow you away. The funniest magic show this side of that fence and Rosie O Arty Parties. If you don’t know what you want or we haven’t got it listed, give us a call. Rosie O, One call we do it all. We are the original ‘have fun will travel’ troupe and will cater functions worldwide! Thank you so much for the FANTASTIC work you did today at Annabelle’s 4th Birthday. The hostess was brilliant and as an early childhood teacher myself I was so impressed the way she managed everything!! She was in control of the party with her many talents, face painting, balloons, fairy floss, games and a jumping castle in tow! Thank you so much for your professionalism, I will certainly be using you again!!! Thank you very much for your wonderful service at my daughters 1st birthday party yesterday. Very prompt with your attendance to the party, fast & amazing face painting, friendly, easygoing & professional service made for a wonderful party. Not easy to keep 30 kids of different ages entertained for an hour & a half but you did an amazing job with your very talented face painting & fun games. After a few dramas with the venue the morning of the party, the wonderful and smooth service of our fabulous party entertainer made my day! Would book Rosie O, anytime. Many cards were given out to friends & family who were equally impressed. Fairy floss was a big hit at the end. One very satisfied customer! Will continue to recommend you. It was lovely having you here and all my friends loved their faces! It was really special and we appreciate all the love and effort you put into each of your masterpieces! Thank you once again, you made my 4th birthday party very special and something I will always remember. Caleb and Tia Rose had the party of the year for their 8th and 9th Birthday – all thanks to you and your gorgeous team! Birthday Cake Jumping Castle, Fairy Floss and then the Animal Walking Balloons where all a huge hit! Children were talking all week after at school! Even the adults wanted their faces painted and a balloon to walk home! Love that you were still happy and smiling after such a huge day and so were your team!